Well. 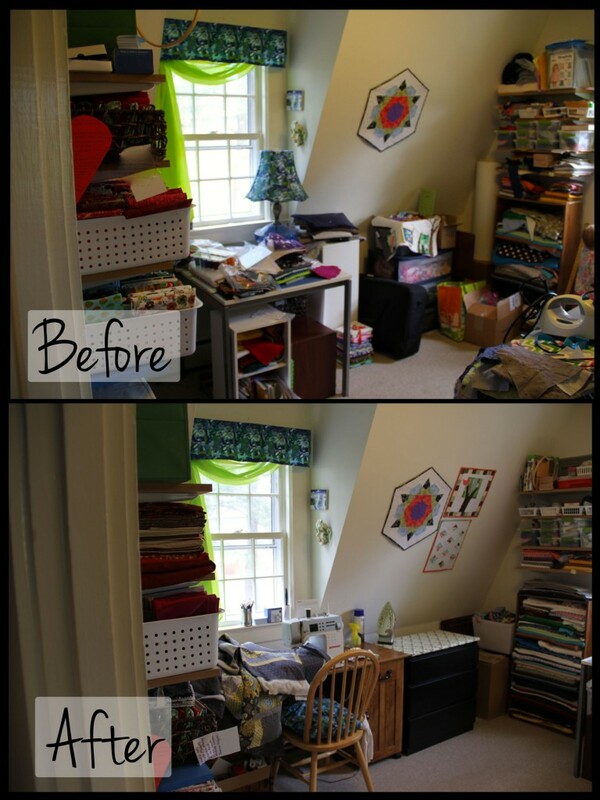 Did you get your sewing space cleaned up? Even if you didn’t share your “before” photos (or if you were too embarrassed to put them out there publicly! 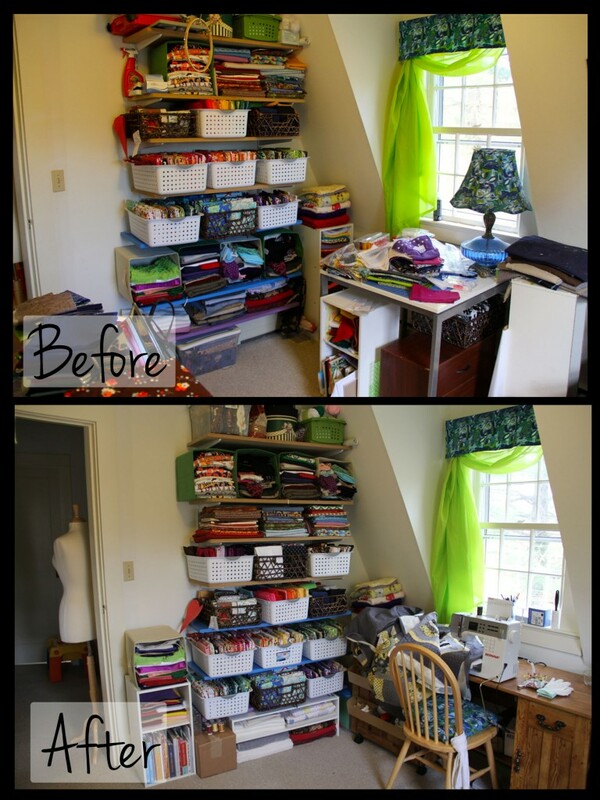 ), I’d still love to see what your sewing or craft space looks like, so feel free to link up at the bottom of this post. Here’s what my sewing room looks like after 10 days of cleaning up a little at a time (now maybe I can keep it clean for 10 days!). 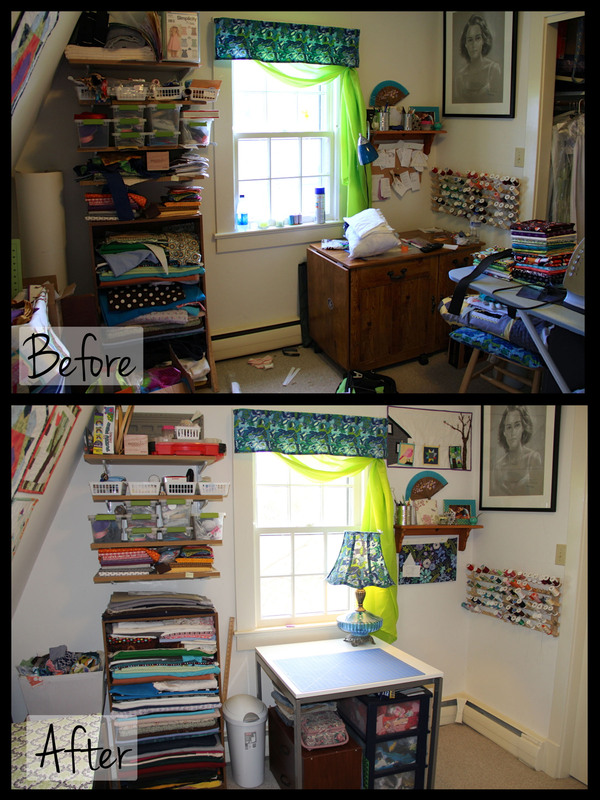 My cutting table and sewing table switched spots in the process of the clean-up, and look! There’s a quilt on my machine! I actually found some sewing mojo while cleaning up, which is just what I had hoped would happen. Also notice the addition of two mini quilts that have been added to my weird, sloping wall that weren’t there before. The shelves below have mostly bottom weight and fabrics that would be used in garment sewing. The upper shelves contain other notions and essentials (glue, pins, webbing, ribbon, buttons, etc.). They needed to be tidied and purged of random papers and things that got shoved in there. And there’s my cutting table, which can actually be used to cut fabric since it no longer contains piles of fabric and mending and thread. The ironing board has been put away inside the closet for the sake of these photos, though I’m sure it won’t remain there long. All of the fabric has been put away, things that don’t belong in this room have been removed. The quilted folded on the chair in the before photo is the one on my machine in the first picture. 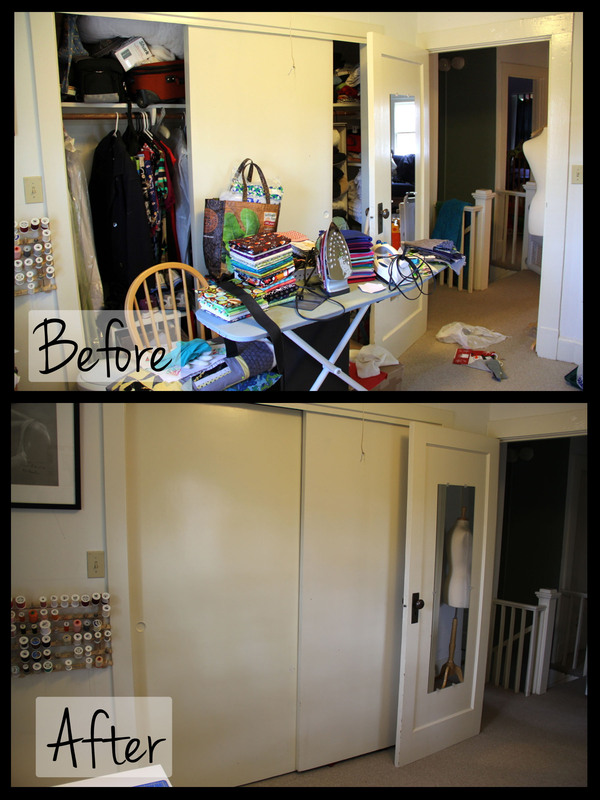 I think that closet door would make a great design will; I just have to figure out how to make that happen! And the wall of fabric. This has been reorganized so that all the quilting fabrics are together. I purged a little, but could probably do more in that area. I’m still hanging on to some fabric that I bought before I knew what I was doing, and the quality is not up to my current standards. There’s that disastrously unusable cutting table in the before photo which has now traded places with the sewing table. 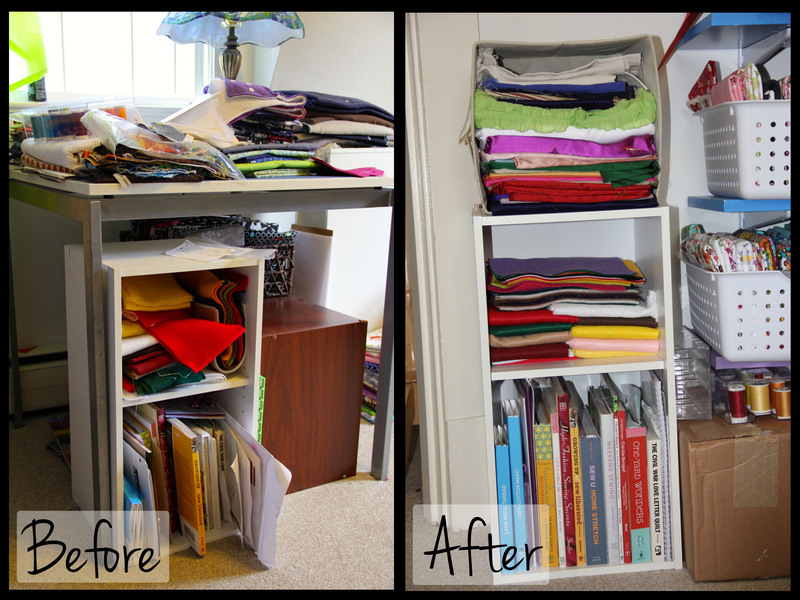 I mentioned that mini quilt when I gave you the tour of the messy “before” space because it really deserves more than to be hanging out over the edge of my scrap bin. Well, now it is hung proudly over some favorite things. I culled all the lists that were completely or partially completed from my pin board and recovered it with a pretty Kate Spain fabric. I love the fabric and I’m glad I decided to put it in a place I can look at it every day. The plastic drawers have scraps that have already been sorted (warm colors, cool colors, neutrals) and they now live under the cutting table. Random shoe shelf is now a fabric shelf and has a home and a purpose. The bookshelf has been straightened and relocated. I really need to find a new spot for that felt, too because I want to use the entirety of this shelf for books. So, can I see your sewing space, too, please? 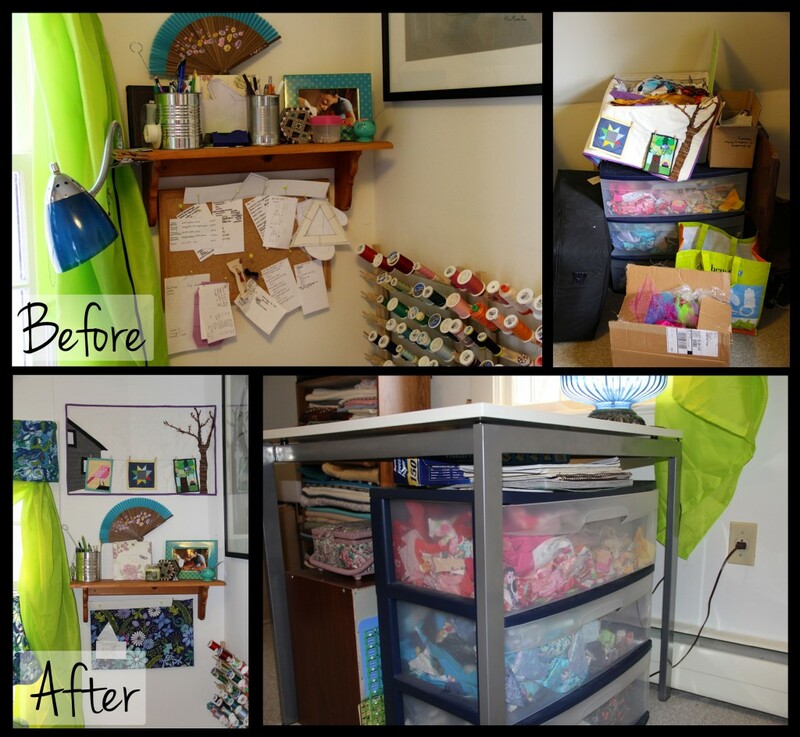 Even if you didn’t clean up along with us, it’s not too late; I’ll leave the link-up open until next Monday, so come take a peek at some other sewing spaces and share yours! Good for you! I’ve been doing more sewing than organizing… so I’m glad you are leaving your link open awhile. I’m glad your clean up inspired you~! Great job! I’m just about to paint (and therefore) reorganize my sewing space. It’s so hard to get started but so lovely when we finish! Great job Em … now let’s see some “littlebits”. Looks great! A design wall idea I read in Quilting Modern (I finally decided to use some of our Amazon reward $ and get it as a present to myself!) that might work for you: Buy a flannel-backed tablecloth and put grommets along one side, hooks in the wall (above your closet door or in the door trim/frame?) and hang when you need it, remove and roll/fold up when you don’t! It sounds easy, so I think I’m going to try it for my sewing room. It will be easy to hide when that room has to be a guest room sometimes.